There is no other hamlet that radiates the true flavor of Tenerife’s traditional villages more than Taganana does. Oozing with cultural and historical importance, this gem is well worth a visit for anyone who will be in the Canary Islands. From a distance, it’s hard to miss the white-walled houses that stand out amidst lush greenery. These houses are tucked into the emerald folds of the Anaga Rural Park which coats the north-eastern tip of Tenerife. Brave the paved winding road that goes down between ravines and then bask in the glory of this hamlet. Surrounded by unspoiled beaches and towering sharp peaks rising from the Atlantic Ocean, one can’t ignore the mysterious yet magical air about Taganana. Unlike the duotone colors Taganana is sporting at present, this gem has a rich and flamboyant past. Its name means ‘surrounded by mountains’ in the ancient dialect of the Guanches, Tenerife’s original inhabitants. This simple and indisputable truth quickly becomes evident as visitors enter the heart of the hamlet. Until 1968, villagers lived their daily lives all but a world away from the capital and the rest of the island. The locals survived on agriculture throughout their history, beginning with sugar canes planted by the Spanish conquerors. Later on, grapevines were added to the hamlet’s main produce. Before the construction of other roads, only the Las Vueltas road link Taganana to the island’s main highway. The path has so many twists and turns that it’s said there’s a bend for every day of the year. Even so, it only took a matter of years before more and more visitors became attracted to this once hidden wonder. With the magnificence Taganana holds, one can stare at it all day from a viewpoint and not get tired of it. However, those who love to get the most out of their visit may embark on the many entertaining activities and places to see. Taganana is doing an exemplary job in preserving its traditional customs and architecture. This is especially true with the Nuestra Señora de las Nieves, the fourth oldest church in Tenerife. Built in 1515, its famous triptych painted Flamenco style is postcard-perfect at every angle. In front of this historic church is a delightful little square. Here, locals and tourists alike can enjoy the serenity and take time out under the Indian laurel trees. El Bailadero, Taganana’s neighboring town, is famous for its many witchcraft stories and interesting legends. It is also known for another thing: El Bailadero Viewpoint. Perched on top of one of the mountains in the rural park, this viewpoint boasts an astounding view of Taganana. Beyond the hamlet’s beautiful houses, the deep blue waters of the Atlantic Ocean contrasts with the dense green vegetation. This million-dollar view can also be savored at the Albergue Montes de Anaga Hostel situated next to the viewpoint. A popular staying place for hikers, this quaint hostel can house up to 40 persons per night. A combination of shingle, pebbles, and black sands welcome visitors upon arrival at Playa Roque de las Bodegas. Its location at the foot of the cliffs of the Anaga Mountain range adds to its charm. This largest beach of Taganana boasts gentle waves that are perfect for the whole family. After a refreshing dip into the cool waters of the Atlantic, beach-goers can feast on fresh seafood at one of the nearby restaurants. Don’t miss the chance to sample some delicious papas arrugadas or wrinkly spuds with spicy mojo sauce. While Playa Roque de las Bodegas’ waves are gentle and child-friendly, Playa de Almaciga’s are for lovers of wild waters and surfing. Cradled by the Anaga Mountain Range, this volcanic beach can be found where the cliffs plunge into the ocean. 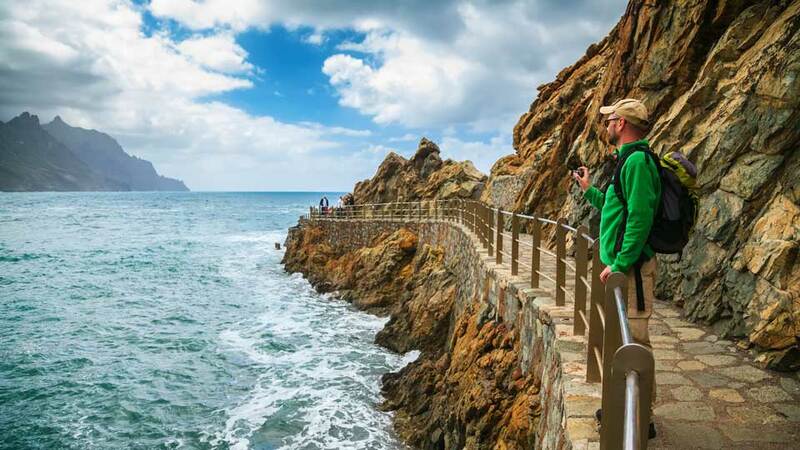 Powerful waves crash against the rock formations of Roque de Anaga all year long. As such, Playa de Alamciga is where several surf schools on the island come to practice. This unspoiled paradise is tucked away on the north-eastern side of Taganana. As isolated and as pristine as it can be, the solitude in Playa de Benijo is enough incentive for travelers. In addition, its unique sands and the splendid view of Roques de Anaga never fail to dazzle its visitors. Covered with rainforest at higher altitude, the Anaga Mountains is the greenest part of Tenerife. This UNESCO World Biosphere Reserve houses the largest number of endemic species in Europe. Thus, hikers can expect exceptional natural beauties while traversing through a network of trails. 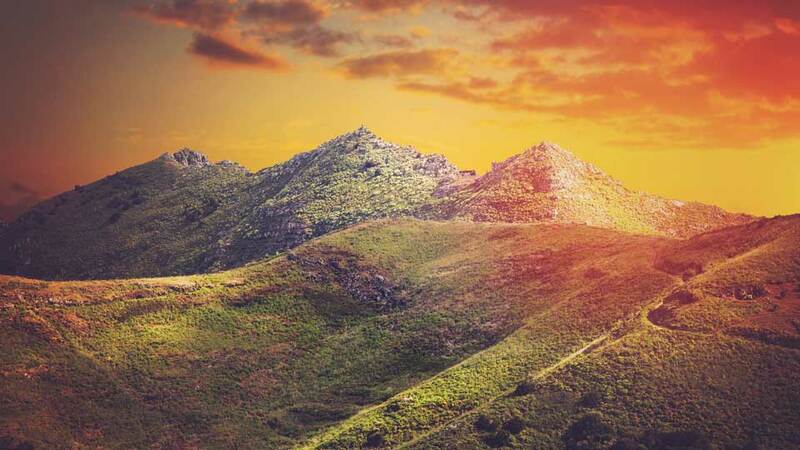 Aside from its importance as a nature reserve, this mountain ranges are also rich in archaeological finds. Among which is the Mummy of San Andrés belonging to the ancient Guanche. This is one of the best-preserved Guanche mummies that is now exhibited at the Museum of Nature and Man of Santa Cruz de Tenerife. Getting to the charming hamlet of Taganana is no easy task. Even with a relatively short distance from the capital, visitors will have to endure white-knuckle ride along winding roads that go down between ravines. Even so, the spectacular scenery and the magnificence of the hamlet itself are all worth the heart-stopping hairpin bends. For visitors driving on their own from Santa Cruz de Tenerife, take the TF-12 and then TF-134 motorways. This journey will take about 40 minutes or more, depending on the traffic condition in Santa Cruz. For a more cost-effective option, take advantage of the reliable TITSA Bus Service. Bus Route 946 departs daily from Intercambiador Santa Cruz and takes passengers straight into the heart of Taganana. The bus leaves at 10:30 and it takes about an hour to get to the destination. The peaceful hamlet of Taganana is not tainted by mass tourism compared to other resorts towns. Its visitors are mainly only up for a day trip or just replenishing from the challenging hike of Anaga Mountain Ranges. Nevertheless, those who choose to stay will have a number of cozy holiday rentals to choose from. This home away from home has two comfortable apartments. Apartment A consist of one room with double bed and is ideal for couples. On the other hand, Apartment B has two rooms and three beds that are good for a small group or family. Both are complete with basic amenities travelers may need. Being located in the heart of Taganana, this beautiful abode is close to the places to be. This comfy hostel is located in the town of El Bailadero just a few kilometers from Taganana. Only a short distance from the best beaches and the hiking trails, this is a favorite place of stay, especially for nature lovers. Albergue Montes de Anaga features a common leaving room and dining room, TV and internet room, terrace and barbecue and everything a visitor may need. In addition, the hostel also organizes unforgettable outdoor activities that guests may partake in. For those looking for a private holiday home in the heart of the hamlet, Casa Campo is the place to be. This spacious abode is only 3-4 kilometers from the beaches and features a balcony with excellent ocean and mountain views. Moreover, this Spanish-style family-friendly property also has television, sun terrace, well-equipped kitchen and is generally clean and nicely kept. For a small hamlet like Taganana, there is a limited number of food places available. Even so, these cafes and restaurants make sure that its guests are in for a gastronomic treat when dining. The great food, excellent location, and friendly staff all contribute to an unforgettable dining experience. Feast on some fresh fish, octopus and salad at Casa Africa – Bar Playa. This family run business serves Spanish and Mediterranean dishes that guests can’t get enough of. In addition, the restaurant features live music entertainment and outdoor seating. This way, diners can sample delicious food, enjoy the view of the Atlantic Ocean, and listen to a lovely serenade all at the same time. This must-visit restaurant is situated by the beach and features a lovely terrace with views over the ocean and Roques de Anaga. Serving local and international cuisines with vegetarian and vegan options, this is a go-to place for those looking for a wider food variety. Furthermore, the owner is very hands on and the staff is friendly, making guests feel at home in this delightful restaurant. Boasting spectacular mountain views and a great selection of local cuisines, Casa Picar is a favorite with locals and tourists. This family-friendly restaurant is set in a traditional Canarian house in the heart of Taganana. While here, make sure not to miss goat meat (cabre) and the fish dish (escaldon) and top it with heavenly local wines. Taganana is the perfect place to be for lovers of peace and tranquility in a rather vibrant island. 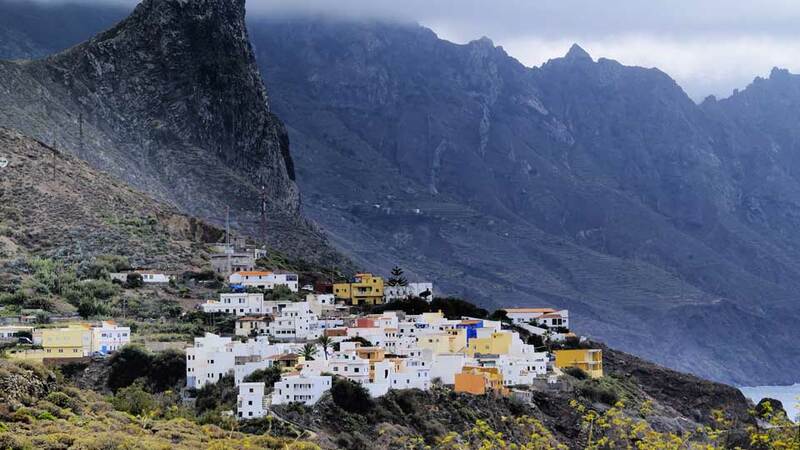 To some, this hamlet in the folds of Anaga Mountain Ranges is the place where time stands still. From the pretty traditional houses to the warm and friendly locals, this place is as laid back as it can be. More than a day trip, tourists feel that they are on a retreat when visiting Taganana. The available activities, accommodation, and places of interest all contribute to this sensation. And with the efforts of the government to keep Taganana as it is, time is likely to remain frozen for a long time.